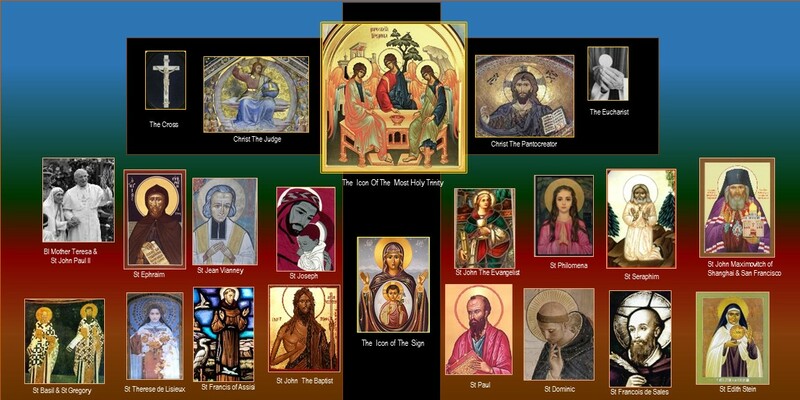 And this is how I found myself with quite a solid and remarkable quartet of saints. But once I had entered this new country, this "land of saints", I became aware of the lesser-known ones and I found myself making new friends again and again. Right behind the front line of the mega saints, there is a huge cloud of witnesses… and they are all here to help us! Do you know the names of Philomena? Or Ponce de Faucigny or Ephraim the Syrian? Gianna Beretta Molla, Edith Stein or Christina the Astonishing? Talk about diversity! Each saint has a unique charism given by God to flourish at a specific moment. And it was given to them for us, to help us grow in the love of God and love of neighbor. Once in that wonderful territory of the communion of saints, I understood better the implication of its premise. It extends to all believers in Christ. "Now you are no longer strangers and foreigners, but you are fellow citizens with the holy ones and members of the household of God". (Eph 2:19). Thanks to prayers and grace, in turn it lead me to better grasp the Trinity. Jesus challenges us to be true followers (that is what being a Christian means, we are "little Christs"). It is a life long process and we get to test it daily in our relationships with our neighbors. It is just amazing to realize the links between all of us, the living and the dead. I thought of my own grand-mother who gave me the foundations of the faith as a child… The communion of saints is based on faith, prayers and charity. It's all about love and it's all about relationships! It took me a long time to really understand this simple truth. I asked the help of the great ones who came before us (which reinforced the sense of membership into one family and which allowed me to see beyond the limits of space and time). I used "prayers" to reach them (and the process of intercessory prayers underlines the invisible bonds between us all and it increases humility and hope and patience, since it has to be done whether you see immediate fruits or not). "In this solidarity with all men, living or dead, the least of our acts done in charity redounds to the profit of all" (Catechism of the Catholic Church 953). It dawned on me recently that there is a parallel in our current global connectivity and the communion of saints! Our recent achievements in new technologies and social networks, our progress in travel, transport and communications, have brought us to a new level of awareness of each other and of the global common good. What are we going to do with this awareness is now the challenge. What did the saints do? Therefore I see hope for all of us. There is such a sense of many things converging today that I wonder what will happen when our minds and souls (and mouths!) will finally work in sync and what kind of critical mass will then be achieved. No matter the great failings of today, no matter the fact that there are still wars and crimes, pollution, manipulation and lies (whether they be the result of personal sins or structural sins), one of the first lesson of the saints is: "Don't be deterred by problems, don't be discouraged by rejections, don't be distracted from the goal! See - and seek - the good in the world. Be part of the sanctification of the world. Know that something else is going on and that it starts with each one of us". a shorter version (different title) was published in Catholic San Francisco on 3/11/2011. It has also been published on the Catholic.org site on March 20; click here. 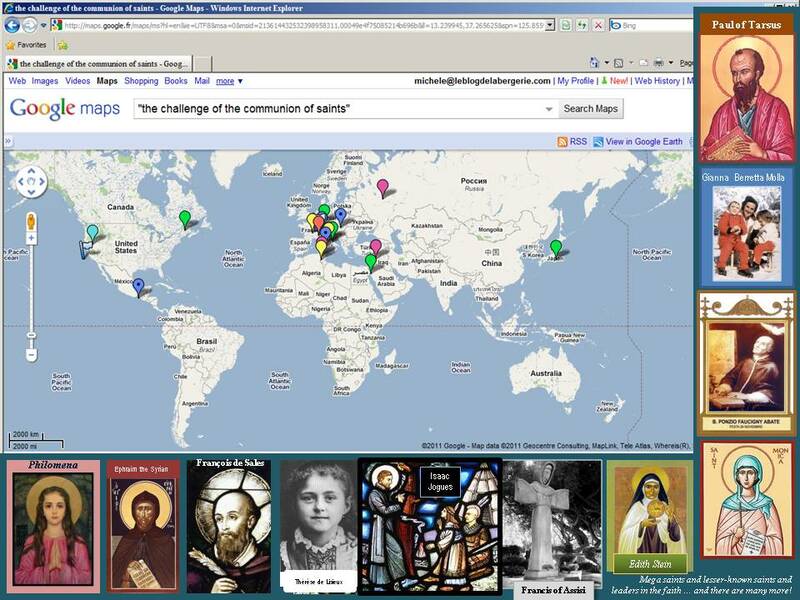 View the challenge of the communion of saints in a google map!